Experience fascinating and sacred places, journeying with a small group looking for the ideal combination of faith, friendship, and fun. The Celts called these sites “thin places,” where the veil between God and humanity is most thin. Imagine seeing such places with a group of joyful pilgrims eager to learn and pray together. Although we emphasize the pilgrimage nature of these experiences, we will be staying at excellent hotels, eat a wonderful variety of delicious meals, and be chauffeured in a luxury coach. Take a look at upcoming offerings and sign up today. 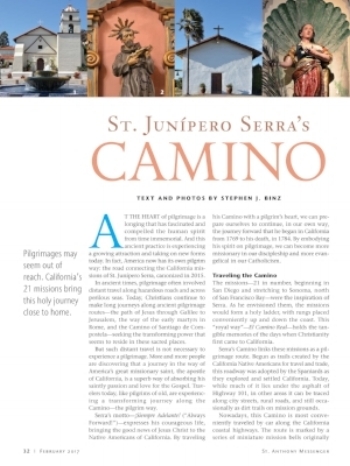 Click on the article to find out more about the new Camino of St. Junipero Serra in California, a pilgrimage closer to home. Stephen Binz’s pilgrimage trip was truly an amazing experience! We saw so many interesting places and learned so much about the historical and cultural background. The retreat experiences offered special opportunities for growth in our personal relationship with God. I would recommend his trips to anyone! “Because of our prayerful and faith filled journey through the Holy Land with Stephen Binz, we decided to take the next step with a pilgrimage to Greece and Turkey In the Footsteps of Paul. It was prayerful, informative, inspiring, faith-filled, and joyful! We were overcome with awe as we visited ancient Ephesus and Corinth surrounded by beautiful fields of red poppies! The islands of Crete, Mykonos, and Santorini were sensory overloads! We loved sharing with fellow pilgrims as we journeyed together, and celebrating Liturgy in beautiful outdoor sites was so prayerful and inspiring. For a deeper appreciation of our Faith and connection to Scripture, we highly recommend this pilgrimage." “The whole trip was absolutely amazing. We especially enjoyed sailing the sea of Galilee and Via Dolorosa. We are so fortunate that we’ve found Stephen Binz to take us and guide us through our Holy Land trip. His knowledge and experience on all the Holy Sites was extremely informative and helpful and his spirituality was greatly inspirational which has left us with a deeper understanding of our faith. Thank you for a beautiful trip!" “We appreciated the spiritual context of the pilgrimage: the masses, the prayers together on the bus, the structure to guide our meditation, and Father Jerome’s homilies and guidance. We appreciated the knowledge that you and George provided to make each event understandable and meaningful. The accommodations were perfect, as was the fellowship of the 4th floor. The dinners with Palestinian families and the meeting with the university students gave us a lot of insight into the complexity of the relationships between Palestinians and Israelis. We loved the fact that you posted a summary and pictures of our trip every day on Facebook for our family and friends to see." “Stephen Binz is a thorough planner and has unique insights that enhance the biblical and spiritual journey of the pilgrimage experience. The hustle and bustle of crowded Holy Land shrines are minimized by his careful attention to details and coordination with extremely knowledgeable tour guides and drivers." “We can’t say enough. This trip was fabulous. The weather, the group size and congeniality, the spiritual growth that took place as the trip meandered through God’s country were all part of a trip of a lifetime. I will never be able to thank God enough for this experience for my family." Please contact me by email and follow me on social media.